A frequently overlooked bad habit that many of us have is how quickly we eat. We may tell ourselves that it’s out of necessity or it doesn’t make a difference one way or another but actually it does. Especially if you are wanting to lose weight, slowing down can be a simple first step toward doing so. 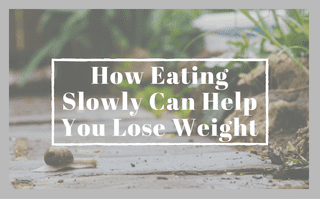 This article will walk you through exactly why it’s important and how to go about eating more slowly. Slowing down when you eat is important for a variety of reasons, not least of which is that the digestive process actually begins in your mouth. When you salivate, you’re not just anticipating delicious food, you’re actually releasing enzymes that begin breaking down your food into smaller molecules for further digestion in your intestines. Without this important first step, you’re less likely to absorb all the nutrients from your food and more likely to experience gas, bloating, acid reflux, and upset stomach. Additionally, there’s a delay in getting the “I’m full” signals from your stomach to your brain, which means that when you eat really quickly, you’re more likely to overeat. Slowing down will give your body time to process the fact that it’s just eaten and signal your brain that you’re satisfied. Eating less is crucial for losing weight so this is an easy way to start becoming more mindful of your intake without having to make any major dietary changes. In addition to giving your body parts time to communicate, slowing down will give you more opportunities to savor and enjoy your food which, in turn, will leave you feeling more satisfied with less food. Rather than wolfing down meals like you’ll never get another chance, look at meals as a moment of relaxation in an otherwise busy day. Think of it as an opportunity to take care of yourself, to relax and take a few minutes to regroup before diving back into the craziness. Lastly, slowing down can help you learn to be present when you’re eating, rather than checking out. This is especially helpful if you are prone to emotional eating or binging. Instead of trying to control it right off the bat, give yourself permission to eat whatever you want but only if you do it slowly. Just the act of slowing down can help you process what you’re actually feeling and what void you’re trying to fill with food rather than something more productive. Over time, this processing can lead you to stop sooner or make different choices. You may be convinced that eating slowly is important, now, but also be convinced that you couldn’t possible take any more time for meals than you currently do. You’re just too busy. To that I say, start small. Figure out whichever meal is the least hectic during the day and worry only about that meal for the time being. Don’t make any changes the first day; just time yourself and see how long it typically takes you to eat. Then make it your goal to tack just one minute on the following day. For many of us, the least hectic meal is dinner since we’re winding down the day and it may be the only meal we eat with other people. If that’s the case, identify the slowest eater at the table and try to match their pace. You can do this any time you’re in a group and it presents a fun challenge. Instead of wolfing down bite after bite and only coming up for air and conversation when you’re done, try interspersing the two and actually carrying on a conversation between bites. Practice putting down your utensils while you chew, taking small sips of water between bites, and actually taking notice of how the food tastes and feels in your mouth. Some of the same tips apply to solo meals as group ones. Putting your utensils down while you chew is a good habit to get into regardless of company. Once they’re out of your hands, there’s less pressure to queue up the next bite while you’re still processing the first one. Take time to actually chew. You probably only chew a few times before swallowing so see if you can get that number up into the double digits. The more you chew, the more easily your body will be able to digest the food and you’ll actually enjoy it more, so it’s a win-win. If you’re not already in the habit of doing so, make it a priority to actually sit at a table when you eat. Don’t hover over the kitchen sink while you scarf down a sandwich. Sit down at the place actually intended for eating. And once there, don’t immediately immerse yourself in your phone or the paper. Instead, try to spend the whole meal distraction-free. When you’re not giving your food your complete attention, you’re much more likely to fall victim to mindless eating and just keep going until it’s gone. When you’re focusing on the task at hand, it’s more enjoyable and you’re more likely to notice when you’ve had enough. For those of you who are tech savvy, there are dozens of phone apps that can help you slow down when you eat. (I know, I know, I just said not to use your phone at meal times.) EatSlower and WaitPlate are a couple of options worth checking out if you’re so inclined. Regardless of whether you want to use assistive technology, it can be helpful to give yourself a “Slow Down” reminder on a post-it or whiteboard where you’ll see it right before you sit down to eat. The above sounds simple and it is. But simple doesn’t mean easy. If you’re a fast eater, you’ve probably been eating quickly for much of your life. This means it may be a tough habit to break. As with anything behavior change, remember to be patient and take it one small step at a time. Once you’ve tackled that easiest meal and feel confident with the new skills you’ve built, move on to another meal of the day until eventually you’re eating slowly almost all the time. Eating slowly is one of the foundational habits of healthy eating. For help tackling many of the others, download your copy of the Body Transformation Guide! I am a certified nutrition coach and personal trainer who aims to help you cut through the BS and simplify your approach to healthy living so that you can love the person staring back at you in the mirror and be there for others who need your help, love, and compassion.